On Sunday evening, the 84th Academy Awards show aired, bringing us red carpet designer dresses, movie clips, sappy speeches, and small statues handed to the luckiest attendees. I have long wondered why the naked golden guy sitting atop a pedestal is called Oscar. Have you? For today’s Amaze-ing Words Wednesday, let’s trace the origin of the Academy award names. How did we get the following? Emmy. The Emmys are awarded for television excellence. The Television Academy started the show in 1949 and looked at over forty proposals before settling on the statuette designed by television engineer Louis McManus, who used his wife as a model. The winged woman holding an atom is supposed to represent both arts (wings of a muse) and science (atom). Then came the naming of the golden lady. Harry Lubcke, another television engineer and the third president of the Academy, suggested “Immy,” a term commonly used for the early image orthicon camera. His suggestion was changed to Emmy, a female name more consistent with the statuette itself. Grammy. Here’s one that actually makes sense! This award presented by The Recording Academy is also called the gramophone award, a reasonable name given the appearance of a golden gramophone on the statuette. For those of you whose music experience has always involved CDs or MP3 players, a gramophone is an old-timey record player, the kind that played music from those huge black discs that went around and around with a tiny needle on the grooves. Shortened, the gramophone award is a Grammy. 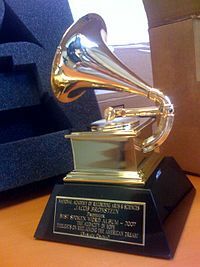 The Grammys have been given out since 1958, with the most recent ceremony on February 12. Oscar. 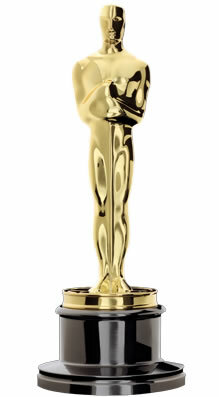 Officially called the Academy Award of Merit, this golden statuette has been known as Oscar since 1939. Oddly enough, the Academy of Motion Picture Arts and Sciences doesn’t know for certain where it got the name. Their best guess? A popular story has it that Academy librarian Margaret Herrick saw the trophy for the first time and said it resembled her Uncle Oscar. Given that the statuette is a golden knight sitting atop a reel of film, I have to wonder what this uncle was like. Tony. 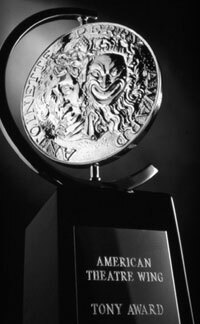 Tony is the nickname for the Antoinette Perry Award for Excellence in Theatre. And now for the next question: Who the heck is Antoinette Perry? She was an actress, director, and co-founder of the American Theatre Wing, which awards the Tonys. She passed away in 1946, and Brock Pemberton, producer and director, founded the Tony Awards in 1947 in her name. Brock and Antoinette worked together, co-founded the American Theatre Wing, and were romantically involved as well, so it was an apt tribute to Perry and the award recipients. So are you a fan of awards shows? Which ones do you most enjoy? Which statuette do you like best? Always look forward to your Wednesday Word posts. Although I am not an award follower, I do enjoy word origins. Good post. Thanks so much! It’s always my pleasure to do these posts. Cool, Julie. I never knew. It’s hard to believe the “Oscar” one, though. It sounds so odd, but… who knows? It’s funny the way you describe the Grammy awards with the gramophone. When you think about it, how would young people know about this, right? My kids do because we still have a “record player” and they sometimes would use it and wiggle the records around to make that sound! I still have a record player too! I inherited my grandparents’ jazz album collection, which I love to play. How interesting. I never watch the award shows, so I never really wondered where the names came from. I think it’s so cool, though, that you took the time to research this and blog about it. You could come over and play your records on my turntable! LOL. I bought one several years back so I could play my old albums. You might appreciate this, Catie. I have Janis Joplin’s Pearl album. How cool. I am not sure I have that one. I have the Janis Joplin Concert album that has the fantastic picture of her tattoo on it. I actually don’t watch either show. LOL! But my fav statue is Mr. Oscar! LOVE finding out where the names come from – soooo cool! I don’t watch award shows on TV. I don’t watch much TV or many movies, and I also don’t listen to modern popular music. But I do like is RWA’s RITA and Golden Heart awards ceremony. It’s always a fun finale to National conference, and who of us who write romance wouldn’t like to win a RITA! (For those not in the know, the RITA is like the Oscars for romance novels, given out at the Romance Writers of America national conference each summer). The award is named after Rita Clay Estrada, one of the founders of RWA. Hey, I wondered where the RITA came from. Thanks for that, Jennette! I follow the Edgars somewhat — the award given by the Mystery Writers of America and named after Edgar Allen Poe. Yes, I would think that the Emmys would be a good watch. The Golden Globes are fun. I thought about figuring out how that award got its name and then decided it was probably just what you’d think — golden statuette, international award = Golden Globe. Thanks, Tiffany. Thanks, Jenny! Whose dress did you like? Just curious. Ah yes, the dresses. There were some lovely ones. And there are always hideous ones too. Thanks, Stacy! Thanks so much, Karen! Whenever I wonder something for too long, I eventually look it up. I always wondered where these awards got their names :). I admit, I’m a sucker for them. As out of hand as the hype can get, I love the fashion and seeing if my favorites win. It’s just fun. I love the awards shows! I’d always heard Betty Davis’ remark that, upon turning the Academy Award around, it resembled her ex, Oscar. Npw, Oscar didn’t confirm nor deny the similarities to his hiney, so no telling if that story’s true. But I love all the stories you highlighted here! I like that theory much better! I love Bette Davis. She was a hoot-and-a-half — not always well-liked but witty.